I don't know if you're anything like me but I HATED any form of exercise at school apart from netball. Everything else I would try & avoid at whatever cost & if you'd have said to me several years ago that I would now be getting up at silly o'clock to exercise I'd have thought you were bonkers. But sadly after hitting my 30s it came to the stage that I realised I needed to do something in an attempt to keep fit & try to take control of my body. Several years ago I'd secretly been contemplating the idea of running but having zero fitness level & with the thought of going outside & attempting to run sending me into a cold sweat, let alone the thought of giving everyone a jolly good laugh at my expense it never got beyond a thought in the back of my head. That's until walking back from the village school several years ago I crossed paths with another mum who'd recently started running. And after making a throwaway comment that I'd love to be able to run I was invited to join her on her next run, which saw me spend the weekend dreading & wondering what on earth I'd got myself in for. Let alone shocking hubby in the process! Anyway that was several years ago & I think it's fair to say I've now got the running bug & my friend & I are still running together now having moved our run from after the school run to just turned 6 in the morning to accommodate busy working lives. Heading out in all weather & even in the dark winter mornings with torches & head lamps to see where we're going. So today after numerous requests to do so I thought I'd share my weekly exercise plan. HOWEVER, before I go any further I would say that I'm sure I'm like most women & will never think I've got the perfect body (is that even actually achievable?!!) & of course after childbirth my tummy is never going to look like it did. I'll happily admit that I'm a complete novice in regard to exercise & don't think of myself as an expert in any shape or form. I've simply made this routine up as I've gone along & my hubby will vouch for the fact that I drive him mad complaining of all the things I wish I could change or those extra couple of pounds I wish I could loose. Anyway here's what I do in an attempt to keep healthy & fit into my clothes. Seriously if I can run anyone can. If you had seen me when I first started I couldn't even run 10 metres without getting stitch & being out of breath but if you run with a friend & set goals you will get there. It's surprising what the thought of a bottle of bubbles chilling in the fridge if you complete the route without stopping does.....yes we did do this once after achieving our goal for the first time, which resulted in us opening a bottle one morning at about 9 to celebrate......luckily it was a Saturday & not much was achieved afterwards but it got us round the route & still makes me smile at the thought now. We live in quite a hilly area & there's still a hill I run up each time that never seems to get any easier but now I know I can just about carry on without passing out & I'm serious when I say I'm the least likely person you will ever meet who you'd ever of thought of would end up running let alone taking their trainers on holiday to run of a morning too! A necessary evil but with some good music on just about bearable! Like rowing something I'm never going to love but hopefully it helps in the battle of the muffin top! Start by getting into a press up position. Then bend your elbows & rest your weight onto your forearms with your body forming a straight line from shoulders to ankles. Engage your core by pulling in your belly button into your spine & hold the position for your chosen length of time. Oh my goodness this is seriously so much fun I just whack on my favourite play list & sing at the top of my voice whilst I hula, which can't be a pretty sight or sound but it makes me smile. You can get a similar hula hoop here. Again I couldn't even do one rotation without the hoop falling but now I can keep going for 20 minutes. Just the one warning, if you're like me & a novice you will probably get bruises on your hips/waist to start with but after a couple of weeks you'll be fine! Using approximately a 6" step/platform step one foot onto the step. Lift your other floor off the floor letting it hang loosely off the platform & hold for a few seconds. Slowly lower your hanging foot to the floor & repeat for desired number of repeats before switching to other leg. I also hold my weights in my hands when performing this exercise. Sit on side of bench/chair with hands on edge and feet stretched out straight. With straightened arms slide bottom off edge of bench & rest heel on floor with legs straight. Lower body by bending arms to 90 degree angle keeping arms close to body. Raise body & repeat. Squats With Dumbbells - 35 reps on each leg, three times a week - shoulder width stance & then the same again with a smaller stance. Stand straight with a dumbbell in each hand (I use 2.3kg dumbbells, like these) with palms facing the side of your legs. Position your legs approximately shoulder width apart with toes slightly pointed out. Keeping your back straight & head up slowly lower your body by bending the knees until your thighs are parallel to the floor. Keeping front of the knees in a straight line with your toes. Exhale as you begin to raise your torso by pushing the floor with your heel as you begin to rise. Then repeat. From a standing position with a dumbbell in either hand by your side step forward on one leg (approximately shoulder width). Then lower your upper body while keeping your torso upright & maintaining balance. Make sure your bent front knee doesn't go forward beyond your toes and keep your front shin perpendicular to the ground. Then push off with your heel & return to the starting position. Once completed set number of reps repeat on other leg. Holding a dumbbell in each hand sit on a bench with feet firmly on the floor, hip width apart. 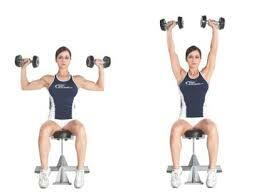 Bend your elbows & raise your upper arms to shoulder height so the dumbbells are at ear level. 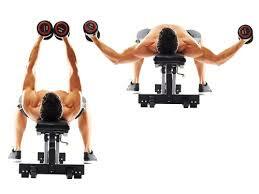 Then push the dumbbells up & in until the ends lightly touch above your head. Lower to starting position & repeat. Lying on a bench with a dumbbell in each hand and feet flat on the floor, push the dumbbells so that your arms are directly above your shoulders & your palms are up. Pull your abdominal muscles in & tilt your chin towards your chest. 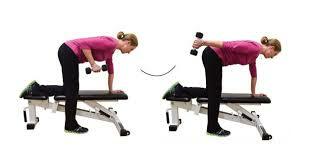 Then lower dumbbells down & a little to the side until your elbows are slightly below your shoulders. Then repeat. Stand with one dumbbell in each hand in front of your hips & palms facing each other. Raise the dumbbells to your sides until your arms are close to being parallel to ground. Then after a small pause lower back down & repeat. One Arm Dumbbell Row - 35 reps on each arm, three times a week. Begin with your right foot on the floor with your left knee resting on a flat bench. With right knee slightly bent lean forward so that you're supporting the weight of your upper body with your left arm on the bench & your back is almost parallel with the ground. With a dumbbell in your right hand & your arm falling straight down & your left arm locked at the elbow to support your upper body weight pull your elbow back raising the dumbbell so that it is roughly parallel with your torso to the side of your chest. 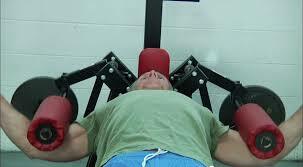 Hold for a couple of seconds then lower & repeat for desired amount of reps before repeating on other arm. Triceps Kickback - 35 reps on each arm, three times a week. Start with your right foot on the floor & your left knee resting on a flat bench, With your right knee slightly bent lean forward so that you're supporting the weight of your upper body with your left arm on the bench & your back almost parallel with the ground. With the dumbbell in your right hand, palm facing your body & your upper arm parallel to your body push the dumbbell back by extending your elbow. Hold for a few seconds then slowing return to the starting position, keeping your upper arm sill throughout. Repeat for desired amount of reps before working the other arm. Pec Flies - 35 reps on each arm, three times a week. The bench we have has the facility to do this with weights attached to the arms (similar to the below picture) & I lift 7.5kg on each arm. 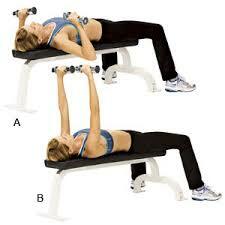 But if you don't have this you can still do the same exercise on a normal bench with dumbbells. Lie down on a flat bench with a dumbbell in each hand with dumbbells raised in front of you at shoulder width with the palms of your hands facing each other. With a slightly bent elbow lower your arms in a wide arch until you feel the stretch on your chest, breathing in as you do so. Then return your arms to the starting position breathing out & squeezing your chest muscles as you do so. Overhead Triceps Extension - 35 reps on each arm, three times a week. Stand with feet hip-width apart & hold dumbell in right hand with arm extended straight overhead & left hand supporting right elbow. 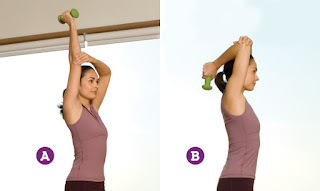 Bend elbow lowering dumbbell behind head then press back to starting position. Repeat desired number of times before swapping arms. So there you have it, as you can see I'm a total novice but I have found that by committing to run with a friend even on days when you don't feel like exercising you will so as not to let your friend down. Also a great soundtrack is key when you're working out alone & for me getting it done first thing is perfect as I don't have time to think about it or come up with an excuse I just have to get up & go plus of course it's out of the way before you think about it & you don't have to spend the day dreading it! Plus if like me the thought of hitting a gym fills you with dread then just invest in a couple of pieces & put them in the garage. Yes it's cold in the winter but once you start working out you don't notice it & the offset of the equipment whilst initially a big outlay is soon paid back if you think about the price of gym membership & of course you can do it at a time to suit you & there's no travelling time involved too. As for eating habits I'm afraid I have a sweet tooth & love chocolate & sweets not to mention crisps & the odd cocktail or two but I try to limit these to weekends. I've recently started making raw brownies for in the week as my daily treat & they're lovely & a great substitute. In fact I've tried a few savoury & sweet recipes from the Get The Glow book & all have been delicious. So much so that I've now bought this spirelli to make courgettie as a pasta substitute & it's fab, really easy & very tasty. Another thing I do is roast a load of chopped veg on a Sunday with either some fish or chicken to use as a basis for meals in the week - perfect for adding to pasta or salad & healthy & tasty too. And this soup maker is the best £30 I ever spent! I simply just throw in a mixture of different veg add some seasoning & water & it makes the most delicious soup in about 20 minutes that will last me most of the week for lunch. But as much as I try to be healthy I'm equally naughty on the food front & am a firm believer in not denying myself anything & certainly couldn't ever be on a diet as I love my food too much & the boys in my life are real foodies. Plus life's too short not to enjoy yourself right?!!! Back to my comfort zone & clothes & here's what I'm wearing today for a quiet one at home. So that's how I attempt to keep fit. How about you? I'd love to hear how you keep in shape & any tips or tricks you can pass on, as like I mentioned earlier I don't in any way, shape or from think I have the perfect body (far from it!) & nor do I think of myself as an expert but having received the requests thought it would make an interesting post. Finally this picture makes me giggle every time I see it. Hope everyone has a fab Sunday. Just a final heads up that today's the last day to use code 8X5H at Boden. Click here to get 10% off everything plus free delivery & returns. All my goodies (see here) I've ordered have now arrived & they're all keepers apart from the slippers. Right I'm off to do some reps with the TV remote ;-) Happy Sunday! P.S. Since writing this post I have now started to incorporate a couple of pilates sessions into my routine as well as walks with friends. That's some serious workouts you do....😁! I'm not sure about the Boden high tops they feel a bit clumpy on! I'm not sure about that Jacqui but it stops me feeling guilty when I indulge with treats lol. I hadn't noticed the clumpiness of the high tops, I just loved them the moment I tried them on but I'm thinking of teaming them with loose fit jeams so if they are a little bulkier they'll balance each other out.....have you kept yours?! I wouldn't say you're novice at exercise at all! Reading that makes me feel exhausted. I hated games/PE at school and still hate all forms of exercise, except running... but running gives me pain in my hips to the extent that I can't walk properly afterwards! (Not that I'm a good runner by any means!) I definitely need to do something though particularly all those arm exercises you've shown as I've started to get the dreaded bingo wings! Oh Sam that's not good. Have you ever gone to a proper running shop where they video your running style on a treadmill? I had a knee problem & it was all down to wearing the wrong kind of trainers for my style of running. Once I'd swapped my trainers after visiting such a store (Birmingham Runner is good if you're local) & started building my muscles up to support my knee with the side step ups I've been fine.....*rushes off to touch wood! * so it may be worth a go. I'm not local, but I might try and find somewhere near me that does that. Thanks for the advice! Definitely worth a go Sam, let me know if it sorts the problem. Waw! Your workout routine is very thorough!! No wonder you look so good in your clothes and look so trim. Do you mind me asking how tall you are and how much do you weigh? You are such an inspiration! Gaynor you're too kind. I'm not sure if it's the best as like I say it's just stuff I've googled but it makes me feel less guilty & has definitely helped. Plus it's a great stress relief & helps clear my head as when I'm trying to run up the hills of a morning the only thing I can concentrate on is breathing & not collapsing!! If it helps I'm 5'7" and just a few pounds under 9 stone. No wonder you look like a model. Feel more motivated to do more myself now, and at least restart my power walking group. All the best to you, especially during the coming winter mornings!! I wish Gaynor! As for the winter mornings its already quite dark of a morning & it definitely takes more motivation but needs must! Power walking is a great way of keeping fit - whack on some fab tunes & they'll be no stopping you! Gosh thank you, I'm a bit OCD so when I decided to do something I kind of feel guilty if I give it a miss which I suppose helps keep me going! Great post and I agree with your philosophy. I took up running a number of years ago as a complete novice, much to my surprise I found it quite addictive, I ended up running in two London marathons, mad or what!! Oh wow Sue what a fab achievement. I have toyed with the idea of running a marathon but I would hate for all the training you had to put in to spoil my enjoyment of the small distance I run now but never say never!! Thanks Michelle, I think the main thing with excercise is finding something you enjoy & makes you feel good. As with all things anything is better than nothing & if you can do it with a friend it's even more fun! Thanks Helen but be careful as running can become addictive!! Thanks Sian & wow that's some achievement 100 miles I'm exhausted at 4! I've not tried off road running, although a friend is always saying I should give it a go but knowing me I'd end up constantly falling over & would find every ditch, dip going, although I know its supposed to be much kinder on your joints so perhaps one day I'll have to swap. Glad I'm not the only one that likes to get it over & done with of a morning, I just know by the evening I'd have got every excuse going to avoid doing any excercise lol! Hope you find somewhere where you can go horse riding again, it always looks so tranquil. Oh my goodness Helen I'd forgotten how my body ached when I first decided to start being more active. The thought of just bending to pick something up let alone walk down the stairs was agony. I'm always amazed each year on our return from holiday that despite still running & doing sit ups etc because I haven't done my lunges parts of my legs still ache for the first few days. And you're right the most lethal thing you can do is take a break as once you stop it's so much harder to get motivated....I have to remember this now the darker mornings are back as it's so tempting just to roll back over to sleep! Lol Lynne, it's probably one of the reasons I don't get much down time & when I stop I fall asleep lol! Aww that's very kind Juanita, I think like you I'll definitely be sticking at 4 miles unless I have a mad moment & end up agreeing to train for a marathon! Which is something that really appeals but I'm just not sure my legs would agree! Oh gosh thank you for such a lovely comment. I definitely agree with you about not giving in & doing all we can to keep fit & healthy as we age. I also find it a great stress reliever too as when I'm exercising I can only think about getting through my run/session so its brilliant for clearing my mind & it makes it stop whirling! Your exercise routine sounds very professional & thorough & you obviously know a lot more about what you're doing than me. Strength training with running definitely seems to be the way forward. Hi, I am trying to arrange your workouts in a weekly plan... ahhh.. struggling... is it 7 days a week? Hi I've actually updated my exercise plan, which if you go to the top of my page, click on home then under the drop down menu click on lifestyle it will show you my most recent post. I generally workout 6 days a week - pilates 5 times a week, running now just twice a week, weights 5 times a week & cycling 4 times a week. Hope this helps.